If you were to poll golfers concerning which of the three nines they prefer, one third would say The Point Nine, one third would say The Woodbridge Nine, and one third would say the new Black Rock Nine. Each nine is named after its most identifiable feature. The Point's number five hole is a short par-four bordering a desert cliff. Any shot to the left on this hole will end up 100 feet down on the par-five second hole. The Woodbridge Nine is also named after its fifth hole. After teeing off from a bluff overlooking the island-green fourth hole, golfers must carry a lake featuring a gorgeous country-style wooden bridge. 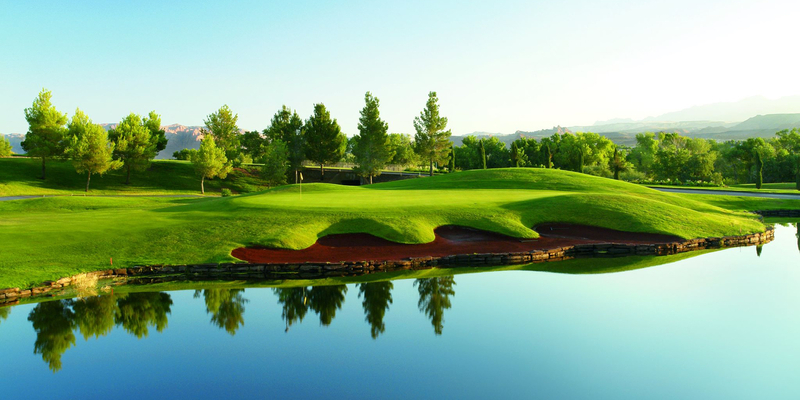 This is one hole so beautiful you won't mind having to record a bogey on your scorecard. The Black Rock Nine is so named as a result of three holes being carved out of treacherous lava rock. The par-four seventh is the most remarkable. After hitting your first shot from a tee located amidst a crowd of molten onlookers, your second shot must carry more volcanic remains plus avoid a small lake strategically placed just to the right of the green. Please call 435-634-5866 for current rates. Call 435-634-5866 for rates and tee times. Contact Sunbrook Golf Club at 435-634-5866 for more information and details on holding a golf outing at the course. Contact Sunbrook Golf Club at 435-634-5866. Contact Sunbrook Golf Club at 435-634-5866 for onsite or nearby dining options. This profile was last updated on 02/09/2016 and has been viewed 9,172 times.